11:50 Peggy has closed the hatch with Thomas & Shane on the other side. They will now pump the air out of the airlock. Then Thomas will be first to leave the station. 12:00 The duo are now just minutes away from leaving the station. 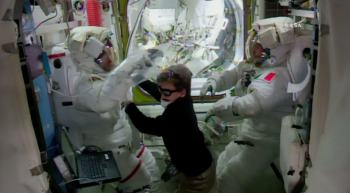 12:06 Peggy saves some photos of the spacewalkers before they exit the station. 12:22 Depressurisation is complete and Shane and Thomas open the hatch. 12:24 Peggy hands Thomas and Shane over to the guidance of fellow astronaut Jessica Meir at the Control Centre in Houston, Texas. 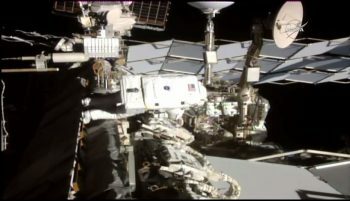 The spacewalk has officially started, with the astronauts switching to battery power. 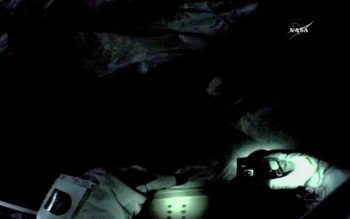 12:32 It is nighttime on the International Space Station so Thomas and Shane put their helmet lights on before exiting hatch. 12:40 Shane and Thomas are ready to get to work. If you are watching live, you can recognise the two spacewalkers by the flags on the spacesuits. 12:42 Thomas and Shane move to their respective work locations. Thomas will grab a foot restraint then move to a truss, in order to inspect a leak. The two are already ahead of schedule by 45 minutes. In case they do finish their tasks early, there are seven so-called get-ahead tasks they may be asked to do. Their primary purpose is to prepare for future spacewalks. 12:50 Shane is moving to the “S0 truss” to start work on installing a new computer called EPIC/MDM. Meanwhile Thomas moves to the P1 truss, he grabs the foot restraint and will then check out an ammonia leak in the Radiator Heat Belt Monitor. 12:58 A view from Thomas as he moves to his workplace at the Space Station’s cooling system in the dark. Thomas has helmet camera 20 and Shane has helmet camera 18. 13:05 Shane is unscrewing the old computer to replace it with the new EPIC/MDM upgrade. 13:10 Shane sliding in the new computer for the International Space Station. 13:23 Thomas is asked to recover his EVA camera and take photos of the worksite for further analysis of the location of the ammonia leak on the ground. 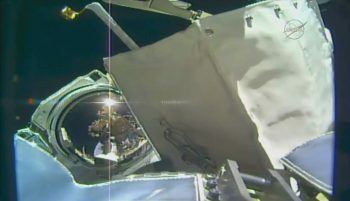 Shane and Thomas are one hour into the spacewalk. 13:30 Thomas starts recording the worksite with a GoPro. 13:34 Shane has finished installing the new computer EPIC/MDM and is now cleaning up the area before moving to his next task. 13:37 Thomas inspects the site of the ammonia leak. He surveys it by patting on the hoses to see if any ammonia is released as he does. 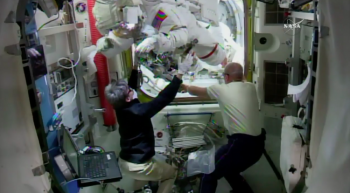 13:44 Shane is performing a glove check, then returns to the airlock to deposit the computer he has replaced. 13:50 Thomas continues with his meticulous inspection. 13:58 1,5 hours into the spacewalk, Thomas and Shane are still approximately 30-40 minutes ahead of schedule. 14:10 Working in the dark again, Thomas is still inspecting the ammonia cooling system – a task set to take 1 hour 45 minutes. 14:30 Thomas will retrieve his tether and egress from his current position, having completed his first task. 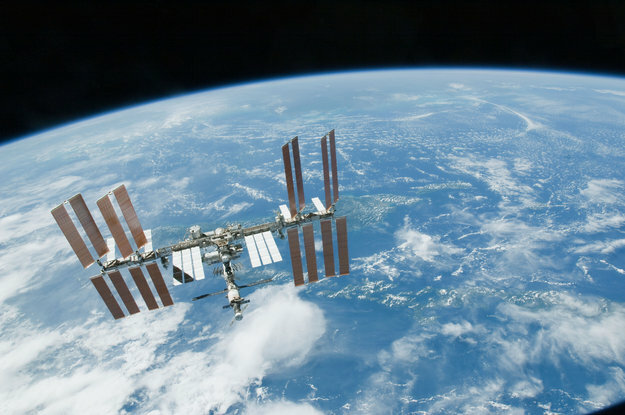 The sunlight is coming back to the Space Station. 14:35 Meanwhile Shane is working on uncoupling the PMA3 docking adapter from the Tranquility module. 14:40 Once Shane is done with the PMA3 disconnect task, he will start working on installing cameras. 14:42 Thomas is removing his foot restraint to install it at his next worksite. 14:50 Shane performs another Glove and Helmet Absorbancy Pad (HAP) check. 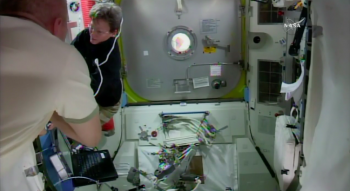 14:58 Shane gets underway to the airlock to pick up new exterior cameras. Shane is still ahead of his time, so he will help out Thomas who is still inspecting the radiator. 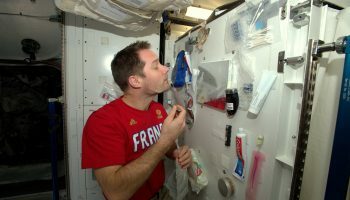 15:00 As Shane is ahead of schedule ground control has asked him to prepare a bag at the airlock for Thomas’ next task. 15:10 Shane brings the cooling bag to Thomas’ next worksite, the LUBE worksite. 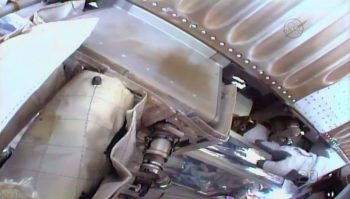 Now 2h45 into the spacewalk. 15:12 Thomas is still checking for the source of the ammonia leak. Specifically, he is looking for frozen ammonia flakes on the isolation. 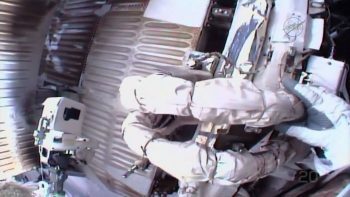 15:16 Shane closes the airlock cover before he drops off a bag for Thomas and heads to the Japanese external facility. Thomas finishes his inspection of the leak. 15:18 Thomas performs a glove and HAP check. 15:20 Thomas gets ready to move to another worksite where he will work on lubricating the end of the robotic arm. This is a normal maintenance procedure. 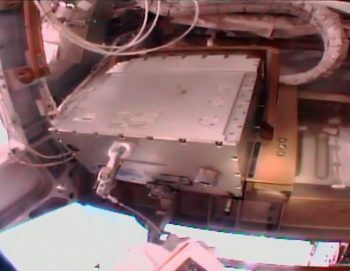 Meanwhile Shane is moving to Japanese module Kibo to replace exterior cameras. 15:25 Thomas is installing a foot restraint and Peggy will move the robotic arm from inside the Station to Thomas so he can work on it. 15:48 Shane is in the process of replacing the cameras. 15:50 Thomas is moving along the foot restraint. He will work on the Special Purpose Dexterous Manipulator (SPDM), or simply ‘Dextre’, that is part of the Canadian robotic arm. 16:00 Thomas is holding what looks like a selfie stick but is the tool he will use to lubricate the Dextre robotic hand. He is communicating with Peggy as she is manipulating the robotic arm. 16:08 Thomas is holding the grease gun that he will now use to lubricate the end of the robotic arm Dextre. 16:12 Thomas performs another glove and HAP check. 16:35 Thomas up close as he is performing his tasks. His work with the lubrication tool will be taking up the majority of his time. 17:05 The space station returns to darkness. 17:35 Shane is swapping out lights. There will be another sunrise in approx. 3-4 minutes. 17:38 The lubrication work of Dextre robotic arm for Thomas continues on his spacewalk. A 3h45 task scheduled to last until 19:00 CET. 17:45 A view of the light that Shane is replacing – his first “get ahead” task. 17:50 Peggy has moved Dextre out of the way now that Thomas has finished his maintenance task on the robotic arm. 18:00 Shane is back at the airlock after the spacewalk duo complete all their tasks. 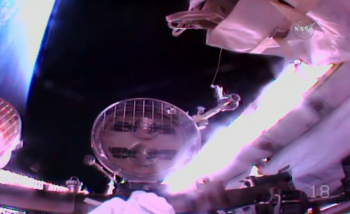 18:12 The two spacewalkers head back to the airlock to end their spacewalk almost six hours in. 18:14 Thomas stores the foot restraint for future spacewalks. 18:18 Shane and Thomas place bags in the airlock. 18:36 Thomas is retrieving another bag to be placed in the airlock. 18:44 Thomas and Shane are in the airlock as the spacewalk comes to an end. 18:54 Usual procedures in the airlock related to pressure equalisation. 18:58 Jessica Meir (Ground IV) hands over to Peggy Whitson (Suit IV). Peggy will now walk Shane and Thomas through the re-entry procedure. 19:02 Oleg and Peggy are getting ready to open the hatch and welcome back their fellow astronauts. 19:10 Oleg and Peggy pull in Shane from the airlock. 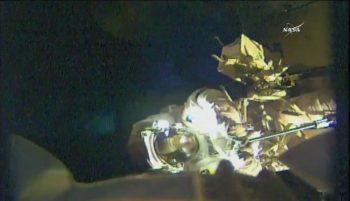 19:12 The spacewalk is now officially over. 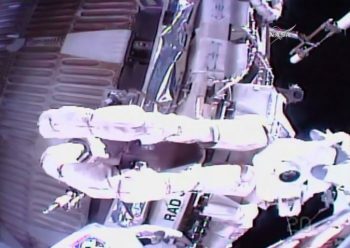 Official time on Thomas’ second spacewalk is 6 hours and 34 minutes. This brings Thomas’ total spacewalk time to 12 hours and 32 minutes. 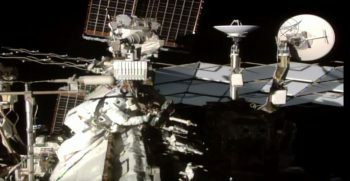 19:14 Both spacewalkers are back in the station. 19:16 Peggy photographs their gloves, to document any possible damage to them. This is a standard procedure. 19:22 Because there was some damage to Shane’s gloves (yellow material on the outside), Peggy wraps them up. 19:30 Peggy helps Thomas take off his spacesuit. 19:35 The live coverage of the spacewalk ends. Thomas and Shane are well inside the Space Station after a successful spacewalk!